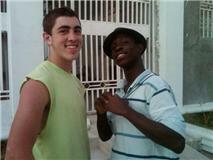 Today we woke aware of this being our last day together in Haiti. Through work and play we have grown fond of each other and work today was mixed with melancholy about parting tomorrow. However, we all had determination to accomplish a lot on this final day. This is the house we worked on all week. It is a duplex with two rooms on each side plus the front porch pictured here. Each two room house will provide housing for an entire family, sometimes up to ten people. The families moving into these houses live in the most dangerous slum of Port au Prince. 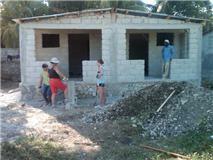 This new home is considered excellent by Haitian families. 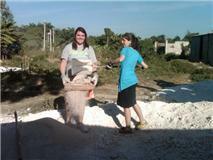 Anna and Sarit are filling a wheelbarrow to fill in the floor hole to prepare for pouring floors. It was a big job and a hot day but Max would not leave before the hole was full. The team all worked together to complete the job. Well done. This has been a great experience for all involved. 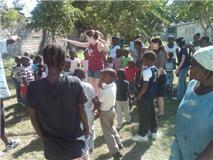 Our team loves our new Haitian friends and look forward to meeting again soon. Martha and Allie will miss their team. Safe travel everyone.